A very private Cottage style home. Set on two floors in a lush one acre enclosed tropical garden. Beautiful views of Flamingo Bay, Only a few minutes walk from the beach, about 2 blocks. Comfortable 3 bedrooms with A/C, 3 bathrooms, 2 kitchens. Maid service and wireless Internet access included. Sun warmed Jacuzzi on upper terrace, pool at garden level. Secluded palm roofed ranchito for hammock siestas. Cable TV in the bedrooms. Howler Monkeys and other nature's delights without having to leave Casa Seahorse! The master bathroom has a walk in tube/shower with an ocean view! The maid will wash your cloths! There are extensive gardens at Casa Seahors that offer privacy, places to explore or just a simple walk. Spanning the length of the house is a covered balcony with ocean views. It is accessed from the living room or the master bedroom. With lots of comfortable seating and a Jacuzzi. There is a fountain and a bench on the covered front entry porch. Daytime Grounds Keeper and Maid Service 5 & 1/2 days a week gives everyone a chance to relax and enjoy their vacation. The local family of Howler Monkeys often use the roof as a bridge to get from one set of trees to another! Bird watcher and nature lovers delight! The home and pool are wheelchair accessible, the majority of the garden areas are not. Each bedroom has it's own full bathroom. Very well located on the brink of one of the best beach spots on CR. Well equipped home, walking distance to the quiet south ridge of Flamingo beach. Great people! Marcos and Renee. The cleaning lady came almost every day. The house has an spectacular view! The beach is a few meters walking. It has amazing nature area, patio, big outdoor area. I liked that it has a rustic design. I recommend it! What to do in the area? Beach combing, swimming, sport fishing, nature watching, canopy tours, horse back riding, sailing, snorkeling, diving, and much more! Your rental includes 6 days a week maid & gardening service.! After you have made your reservation we will be sending you our company reservation form to complete and return to us. This form has the same rules, regulations and terms as stated on HomeAway. It asks for details about your arrival so we can organize your check in and it also requests emergency contact information. Any information you provide on the form is kept private and only use if there were an emergency. We provide you with directions to our office where we meet you when you arrive. 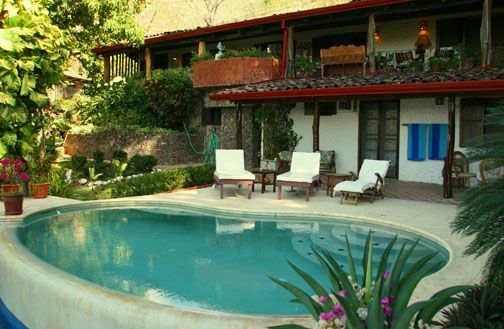 We then show you to Casa Seahorse and answer any additional questions you may have. Monthly rental prices include utilities. Tipping the maid and gardener is appropriate!